The Queen of Swords in a Tarot reading is about physical charm and attraction, there may be high virtues but this is tempered by a cold personality that has experienced serious loss and sees a relationship as a necessity for their material upkeep. In the reversed position it is a toxic relationship unable to resolve past bitter experiences and sense of loss. Her right hand raises the weapon vertically and the hilt rests on an arm of her royal chair the left hand is extended, the arm raised her countenance is severe but chastened; it suggests familiarity with sorrow. It does not represent mercy, and, her sword notwithstanding, she is scarcely a symbol of power. Widowhood, female sadness and embarrassment, absence, sterility, mourning, privation, separation. Malice, bigotry, artifice, prudery, bale, deceit. A bad woman, with ill-will towards the Querent. 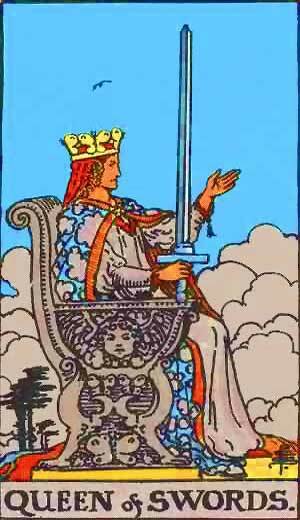 Queen of Swords – Widowhood, Loss, Privation, Absence, Separation. A Bad Woman, ill-tempered and bigoted, Riches and Discord, Abundance together with Worry, Joy with Grief. Widowhood, female sadness, privation, absence, sterility, poverty, vacancy, unemployment, mourning, separation. Reversed: Bad woman, malice, bigotry, prudishness, hypocrisy, artifice, deceit. The female rulership of the element of Earth on the house of Taurus, in which the Moon is exalted and ‘womanhood eternal’ is contained. The house of money, in worldly affairs. So this card must mean either woman ruling by matter, material or magnetic attraction, purely physical charm, or ruled by material elements herself. The latter may be seen as: ruled by the desire of luxury and money, or as: overpowered by material difficulties, weighed down under the burden of a material world. A woman of Saturnian and Martian qualities is seldom charming unless in a purely physical and sexual way; there may be higher virtues, however, which in this case will be developed by suffering, such as chastity, severity, continence–from which it will be easily seen, that sterility, privation and mourning may derive, personally. Astrologically the Martian and Saturnian qualities are seldom found to be very ‘benefic’ for women, being very often signs of an unpleasant character or injured reputation. On the one hand this card may be a woman under affliction and severed from her natural protector or protection–widow, divorced, separated, though not the unmarried; on the other hand we have to see in this card the woman who is paid for her ‘love,’ and the fact that “woman costs money,” a fact of more occult significance than the world at large understands. It is indicated in the commandment of JHVH that ‘man’ should till the soil (Taurus) after the loss of the paradisical state. So this card has to do with the material necessity of married life, with peasantry and husbandry and economical exploitation. Well aspected, it may indicate art in general and sometimes wealth after assiduous struggle and toil. The vesica combined with the ankh refers to the letter Heh. This card refers to mental and creative activity in the astral plane. It is the power of mental imagery directing subtle astral forces. From the beginning of the third decanate of Capricorn to the end of the second decanate of Aquarius, January 10th to February 8th, under the combined rulerships of Mercury, Saturn Uranus, and Venus. A woman of some authority, outwardly agreeable and complaisant, but inwardly ambitious and subtle. Keen perceptions, good observer, self-confident. Accurate in superficial details. Graceful, fond of dancing. More information on the Queen of Swords Tarot card. This entry was posted in Tarot, Runes and Divination and tagged capricorn, conflict, deceit, earth, feelings, grief, love, money, stress, swords. Bookmark the permalink.